Crafted in the true style of the Art Deco inspired fashions, this dress is crafted in silk chiffon, gold metal thread, and glass beads. 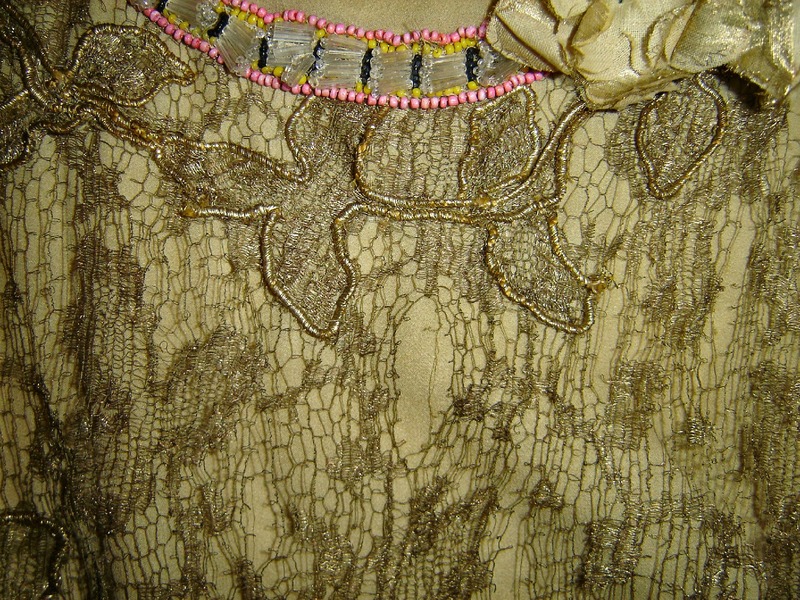 The design of this dress is typical of the period. A narrow strapped shift with a scooped neckline. 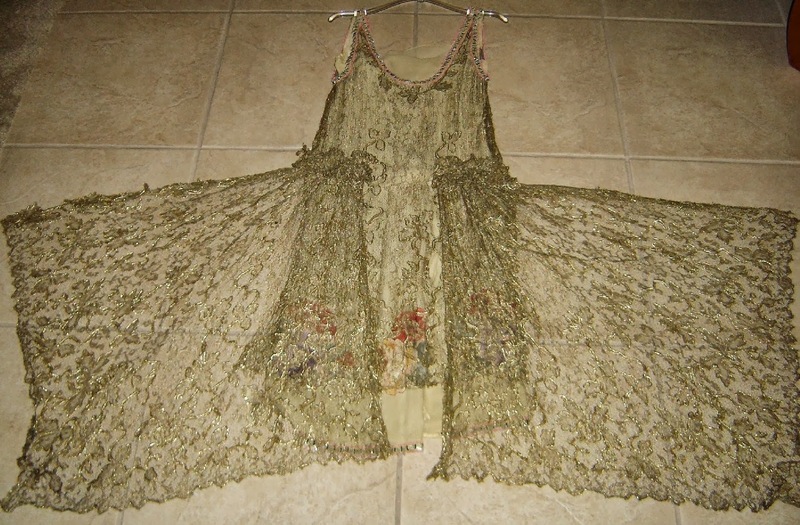 There is an simple underdress of ecru chiffon and an elaborate overlay in gold metal thread and glass beads. The neckline and backlinie have been modestly covered with an insert of the ecru chiffon giving the neckline a straight edge. 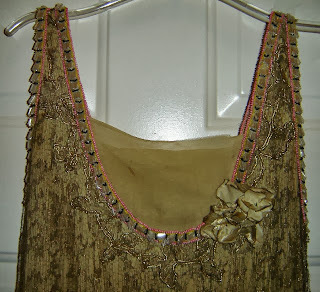 Around the actual scooped neckline, armholes, and underdress hem is the elaborate beading. The beads include pink, yellow, and black cylinder beads, and 5/8" cut glass bugle beads. 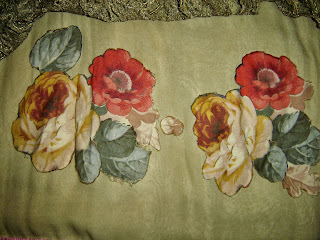 On the left side of the neckline is a corsage of lam'e fabric flowers. 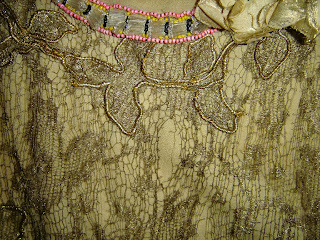 The overlay is crafted in a spider web weave of gold thread and incorporates a floral pattern. On top of this are flowers created in outline with gold bullion. 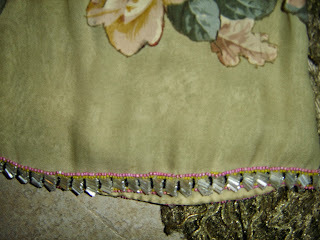 4" above the underdress hem circling the entire hemline are appliques of cabbage roses in various colors peeking out from below the overlay. 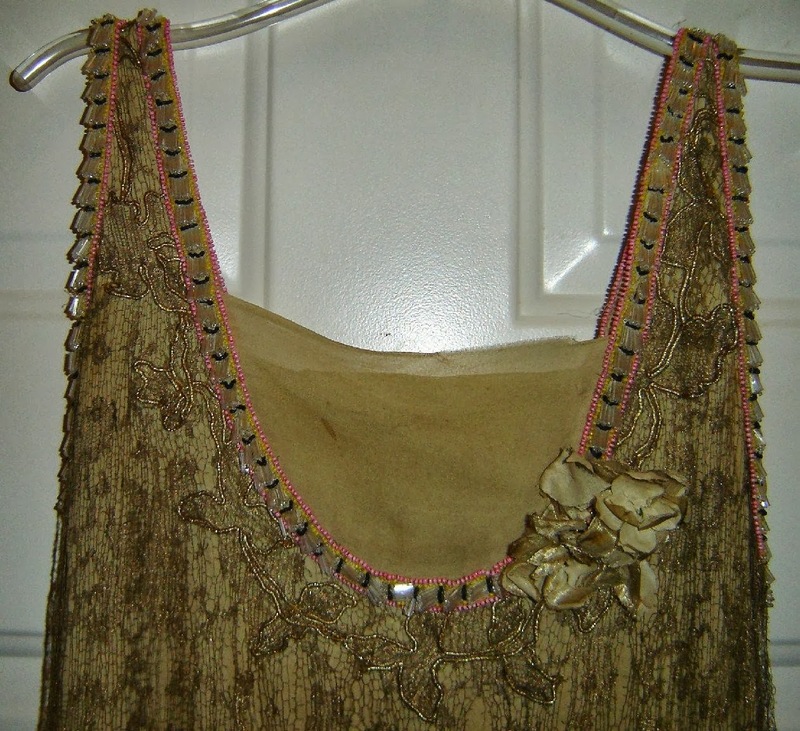 Finally, the dress is detailed with two bunches of the gold fabric at the back hip. 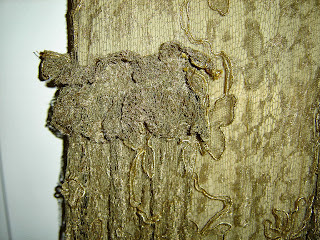 Attached to this are two squares of the gold fabric attached at one corner to form two "tails" which cascade in points to below the hem of the dress. There are no closures on this garment. As per the period it is meant to be slipped on over the head. The dress measures: bust 34", waist 35", hips 36", top of shoulder strap to hem 44", and top of shoulder strap to tip of tail point 56". This dress APPEARS to be a size 4. This stunning dress is truly a piece of American History. 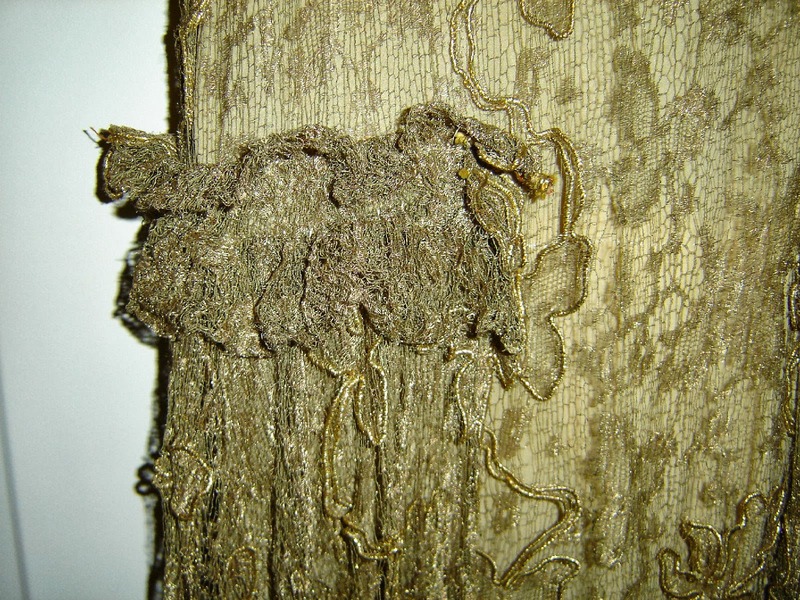 From one of the most exciting periods in fashion and art, this is a garment which exemplifies both. A most important addition to any collection. 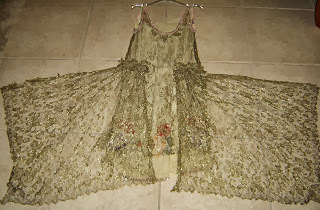 This gives me an excellent idea for my next 1920's gown.... 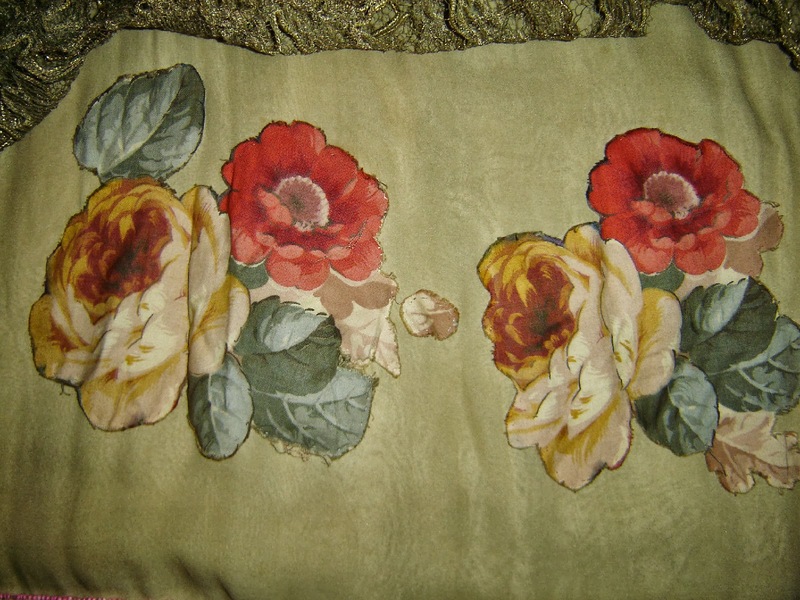 I really just love the pink beading at the edges and the cute roses at the hem - all very lovely. Notice also how simple the lines are - even the scarves on the edges are just big squares.